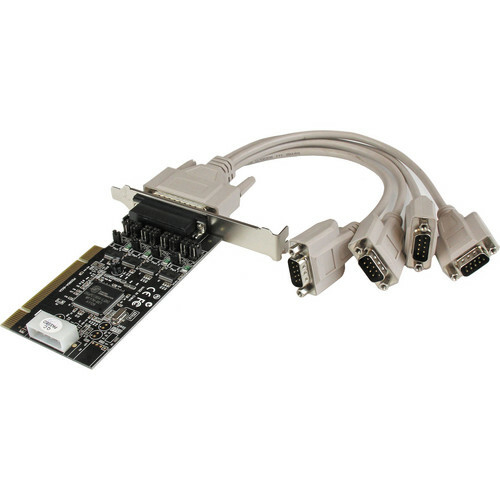 The black 4-Port RS232 PCI Serial Card Adapter with Power Output from StarTech turns a PCI slot into four RS232 (DB9) serial connections and enables compatible devices to draw power from the serial ports. Suitable for many RS232-powered serial applications, this PCI serial card offers a selectable 5V or 12V power option, capable of power output using pin 1, 4, 8 or 9, which enables you to configure the card to suit the requirements of your powered RS232 devices. A flexible solution for adding serial ports to full-sized or small form factor systems, the PCI serial card includes both low- and full-profile brackets. It also includes a breakout cable which helps to avoid cluttered connections. Box Dimensions (LxWxH) 8.4 x 6.2 x 2.2"